Model 881 ESR and DCR Capacitor Tester measures equivalent series resistance of electrolytic capacitors in or out of circuit, and can also be used to measure low value non-inductive resistors. 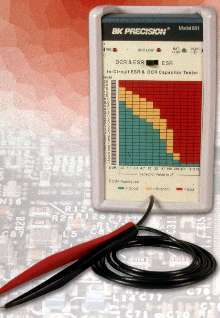 Tester, in DCR and ESR Mode, detects shorted capacitor in its DCR cycle and also determines its ESR value. Unit measures ESR and DSR from 0.1-30 ohms, automatically calibrates internal signal, and incorporates 3-color, front panel chart that shows ESR readings of Good, Fair, and Bad. Resistance Tester withstands extreme field conditions. Test Tools combine insulation tester and multimeter. Packaging Tester measures puncture force of rubber stoppers. Monitoring System continuously measures partial discharge.